Me posing with a piece that adorns the wall of a pastry shop. George Town is the capital of the state of Penang in northern Malaysia and is one of the country’s main tourist draws. With its gorgeous architecture, atmospheric streets and mouthwatering food, George Town is my favourite city to visit in Malaysia! It’s also listed as a UNESCO World Heritage site due to its historic importance as a place of trade between East and West in the past 500 years. According to UNESCO: “Featuring residential and commercial buildings, George Town represents the British era from the end of the 18th century. The two towns [George Town and Malacca] constitute a unique architectural and cultural townscape without parallel anywhere in East and Southeast Asia”. 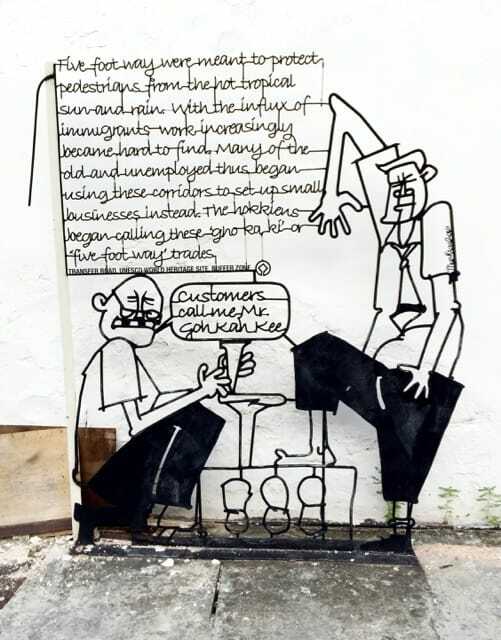 On my recent visit to Penang, I discovered a wonderful addition to the urban scene: nostalgic street art in George Town! I’ve seen street art in many cities around the world, like in Rio de Janeiro, Melbourne and Valparaiso, but the street art in George Town won a special place in my heart in an instant because many of the scenes brought back fond childhood memories from the time I used to live in Malaysia. 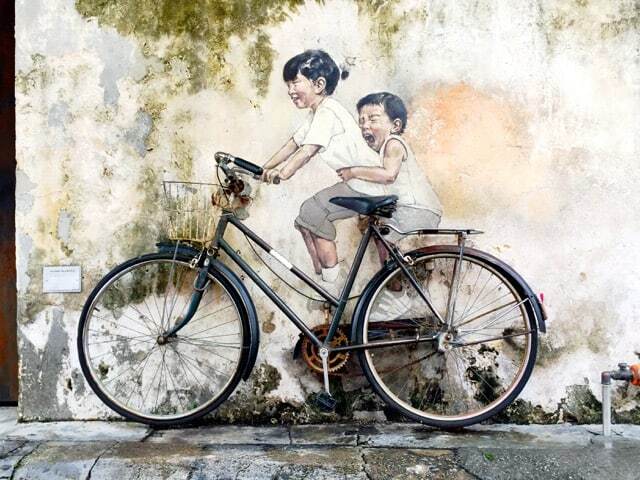 In 2012, the Tourism Board of Penang commissioned Ernest Zacharevic, a young artist from Lithuania, to create six works in the streets of George Town. The result was stunning and quickly gained worldwide fame. I’d heard a lot and seen many photos of these six works of art so on my recent trip, I made it a point to find them. This made my stroll around George Town so much fun as it felt like I was on a treasure hunt! Along the way, I discovered many more pieces of art commissioned by local companies and organisations. Boy on a motorbike – by Ernest Zacharevic. Another piece by Ernest Zacharevic that brought an instant smile to my face! This piece brought back childhood memories! That would’ve been me hanging out the window and yelling for the food vendor to stop! It adorns the wall of Ming Xiang Tai pastry shop. If you like egg tarts, this is one place you won’t want to miss! This cartoon piece made me laugh out loud! It cleverly and humourously depicts the clash of generations in Malaysia. These pieces are also used to explain certain historical facts and traditional customs. Or point out the original work place of arguably Penang’s most famous son: Jimmy Choo! The street art along Nagor Street. Another great piece in a lane just off Nagor Street. 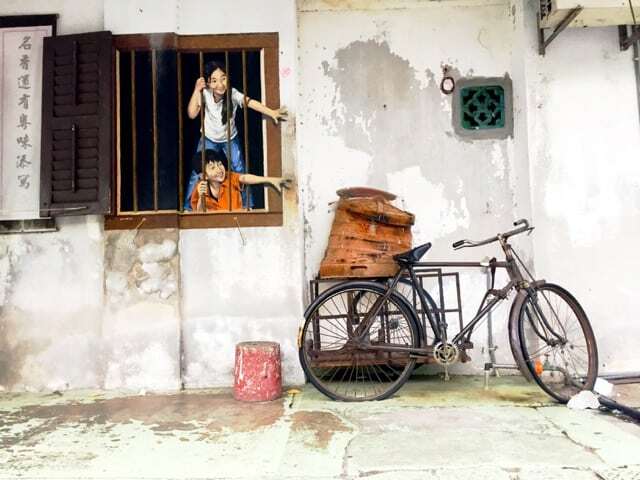 I LOVED the street art in George Town by Ernest Zacharevic as they got me reminiscing about my childhood days and I especially appreciated the interactive nature of his ‘3D’ street art. Many of the pieces comprised paintings of children in every day scenes (from my youth) accompanied by a prop, such as a motorcycle, bicycles and even swings. It was lots of fun to see passers-by posing and interacting with the pieces in all sorts of ways! My friends did an especially good job in entertaining bystanders with their wacky poses! Haha! My best friend posing. Too funny! Certain quarters question the presence of the street art in George Town, a protected UNESCO World Heritage site. I think that these pieces are a great addition to the townscape as they beautifully (and often humourously) depict local cultures, customs and traditions. If you’re visiting George Town, make sure to keep an eye out for the gorgeous street art in the historic city centre, or you can, like I did, make it a little treasure hunt to find these pieces! This info brochure will help you along. 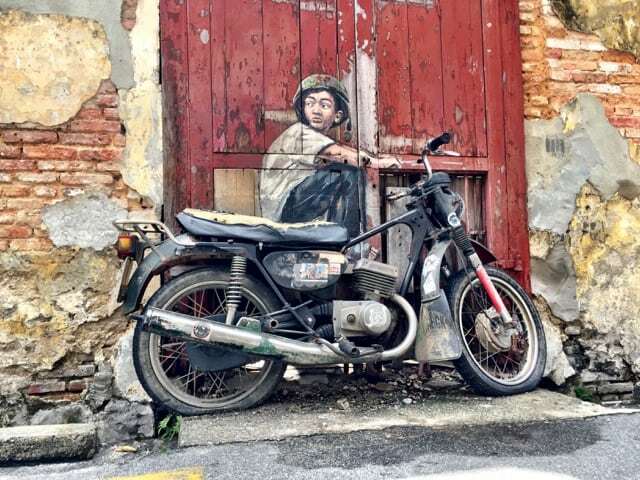 Read more about things to do in Penang on Velvet Escape or this comprehensive article about street art in Penang. I’m pretty sure you’ll enjoy Penang! Great photo opportunity you found! I travelled to Penang a couple of years ago and really enjoyed George Town. I did notice a lot of the street art there and thought it was wonderful. Such a cool place to just go for a wander. Thank you Tiago! I love Penang!